Luxuria is an ultra-luxury oceanfront condominium residence situated on the East side of South Ocean Blvd (A1A) in prestigious Boca Raton, FL. 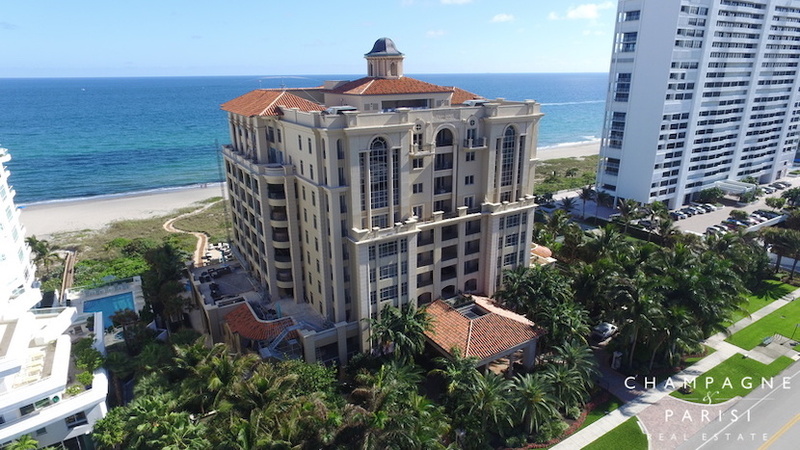 Constructed in 2008 by Boca Ocean Development, LLC, Luxuria, inspired by the grandeur of European royalty, boasting a certain Old-world charm and regal sophistication unmatched by any other luxury condominium residence in all of Boca Raton. This boutique 10-story building sits on a two and a half acre beachfront site boasting some of the most incredible unobstructed views of the Atlantic Ocean and the Intracoastal Waterway. These ultra-luxury estate properties offer an elegant yet modern lifestyle with all the incredible benefits of oceanfront condominium living. The white-glove service and five-star amenities provided by this full-service building, along with its award-winning Marc-Michaels interiors and unparalleled beachfront location, makes Luxuria one of the most exclusive residences in all of Boca Raton, offering luxury condominium living at its absolute finest. Luxuria boasts some of the most impressive luxury residences imaginable, each featuring massive square footage that offers the feeling of living in one's own private beach house. The residences at Luxuria include 22 estate-style condominiums with private spas, two bi-level penthouses, and two single-family estate homes with private pools. Luxuria condominiums offer the utmost privacy to its residents, with computerized security and keyless fingerprint access to private elevator and door entry. Luxuria residences also feature expansive oceanfront balconies and verandas perfect for entertaining, many of which also feature summer kitchens and outdoor BBQ areas. Units feature Crestron home integration systems, including an integrated light and control system, pre-wiring for automated drapes and blinds, and pre-wiring for the latest TV, telephone, and high speed internet access needs. All units also feature state-of-the-art front-loading washers and dryers. Gourmet Kitchens include European designer limited edition cabinetry with onyx under-lit counter tops and granite and stone counter tops with full back-splashes. Appliances include a 48” gas range and grill for condos and 60” for penthouses and single family houses, Sub-Zero 36” refrigerator and freezer with custom cabinetry, Sub-Zero 72 bottle wine chiller for residences and 132 bottle wine chiller for penthouses and single family homes. Kitchens also have Franke Artisan 46” triple chrome sinks, instant hot/cold butler and pot filler faucets. They are also equipped with an oven range, Dornbracht faucets, Thermador warming drawer, a built-in Miele coffee maker and an Elkay 60” Mystic River island sink. Oceanfront master suites include a midnight kitchen and wall safe in the spacious custom walk-in closet. Master bathrooms have flooring and shower walls made with imported marble and stone, Dornbracht rain shower head, multi-spray body shower and faucets, Kohler elongated water closet and bidet, and a Madison Jacuzzi tub with TV for residences and a La Scala Jacuzzi tub and TV for Penthouses. Each luxury residence at Luxuria boasts custom designer details and high-end finishes, including floor to ceiling glass walls, exotic marble and stone flooring, counters, and accents, Venetian plaster walls, and elaborately detailed ceilings and intricate moldings. Luxuria is a five-star, full-service building with 24 hour security, concierge and valet services. The concierge caters to the owners every need such as arranging for private transportation, dry cleaning services, and flower and plant maintenance within each residence. Catering to the specific needs of each resident, they will arrange fine dining or spa reservations, prescription pickup, package pickup and delivery, pet grooming drop-off and pick up, or any other service that is requested. The pool and spa overlook the ocean and is surrounded by cascading fountains, manicured gardens and lush landscaping. There are also cabana baths and a full time pool and beach attendant staff. The state-of-the-art two story fitness center has a resistance pool, custom training and fitness equipment. The oceanfront lounge is a multi-function room equipped with a bar, billiards, catering kitchen and 7-seat media room. Luxuria is located on A1A, just South of Camino Real in the heart of the pristine Boca Raton beachfront. Surrounded by other ultra-luxury condominium buildings such as Aragon and The Addison, Luxuria boasts an incredible oceanfront location close to the best of what Boca Raton has to offer. This prime location offers residents the luxury of being able to step directly on to the beautiful sandy beach that lies just outside thier door, as well as the convenience of being close to the finest dining, shopping, entertainment, and recreation options in the area. Luxuria is just minutes from the world-renowned Boca Raton Resort & Club, as well as the exlusive Boca Beach Club, and a short drive to Downtown Boca Raton, Town Center Mall, and I-95. If you are interested in purchasing a Luxuria condominium, or would to learn more about other Boca Raton luxury condominiums, please call us at (561) 235-7800. Alternatively, you may provide your contact information in the brief form below and one of our Boca Raton luxury condo specialists will be in touch to promptly assist you. We at Champagne & Parisi Real Estate are your go to resource for buying and selling luxury condos in Boca Raton and the surrounding areas, and would be absolutely delighted to assist you in making your dream of oceanfront luxury condominium living in Boca Raton a reality!